The following lessons should not be taken as a substitute for personal hands-on instruction with a competent instructor. These lessons are being made available as a refresher for my former students and as a primer for my future students. Warning! Handguns were created to give people an effective self-protection tool to dissuade persons with ill from carrying out evil deeds. Dissuading persons with ill intent may require the application of bullets to their flesh, maiming and possible causing the death of the criminal. What makes the handgun effective in thwarting evil also makes it dangerous to the untrained and careless. 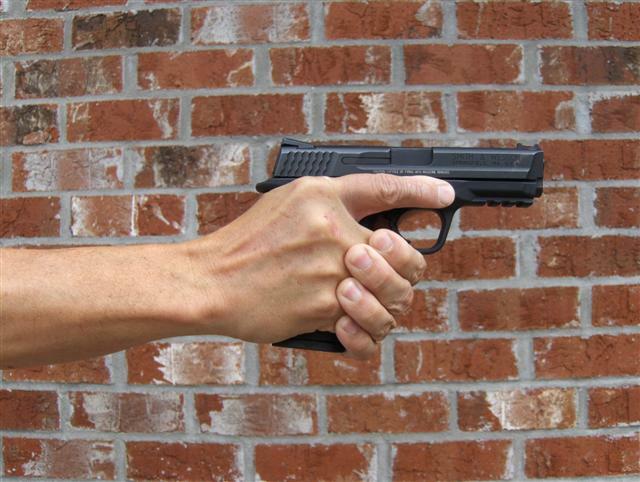 Safe gun handling is vital and must be practiced devotedly. Neither I, nor The Hickman Group, LLC assumes any responsibility for the use or misuse of the following information. All guns are always loaded.Even if they are not, treat them as if they are. Keep your finger off the trigger until your sights are on the target. This is the Golden Rule. 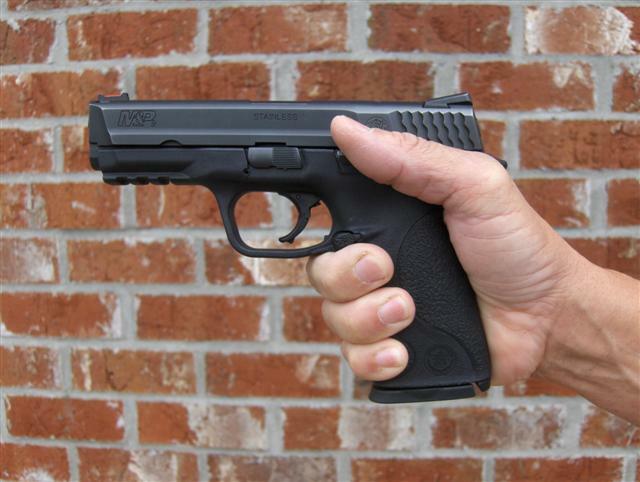 Its violation is directly responsible for about 60 percent of negligent discharges. Identify your target, and what is behind it.Never shoot at anything that you have not positively identified. 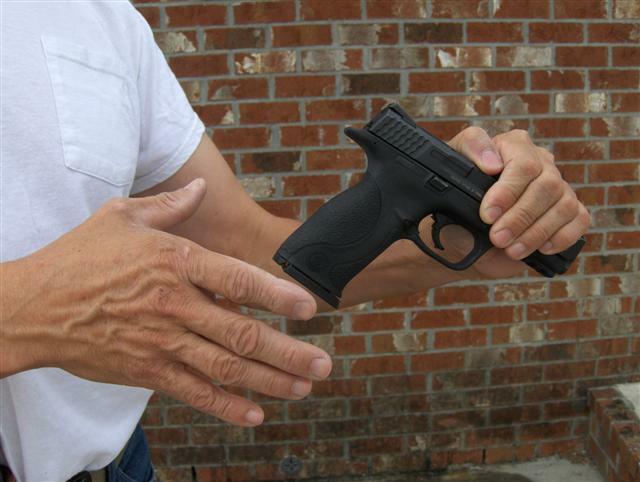 Memorize these rules and make them integral to all your gun handling. 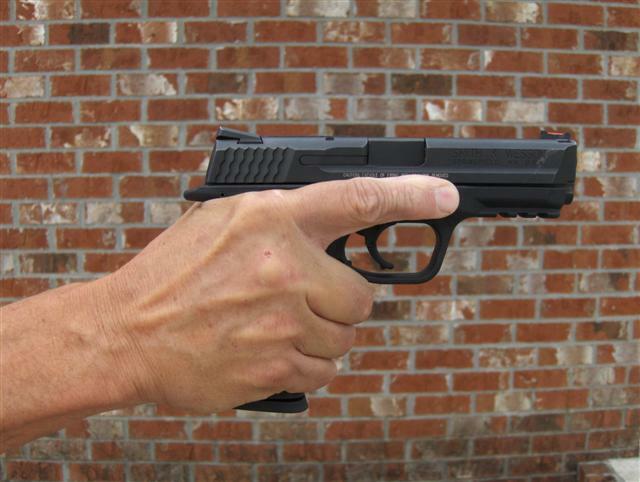 What does it take to make a perfect shot with a handgun? What I am now teaching did not originate with me. After significant research, training, and shooting, I have adopted what I see working best for most shooters. Since pistols are more common today for defensive use, we’ll start there and address revolvers later. We’ll begin with the grip. For pistols the best grip, at this time, positions the thumbs high and forward. This grip seems to have originated in the competition world. A little research on my part found this grip was written up as early as 1990 by Brian Enos in his book Practical Shooting, Beyond the Fundamentals. 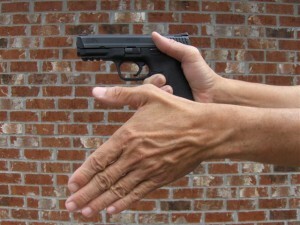 You may begin by picking up the pistol with your dominant hand or you may pick it up with your complementary hand by the slide and place it in your shooting hand. 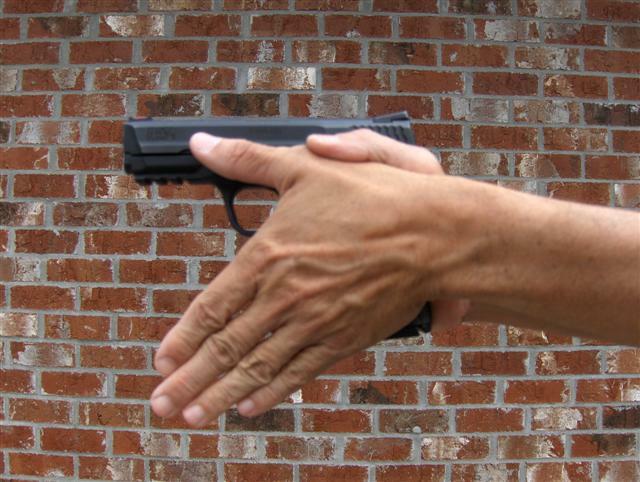 Your shooting hand should be as high on the back strap as possible because this give you the best control of the pistol during recoil and enables you to get back on target faster. It is very common to observe novice shooters gripping the pistol too low. Your complementary hand should now be cammed over with the thumb extended so that the thumb becomes an inline extension of the forearm. With the thumb extended this way, the fingers of the complimentary hand are now at about forty-five degrees in relation to the bore. 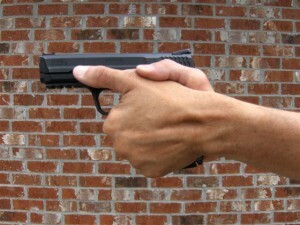 Next, position your complementary hand on the pistol, placing the base joint of the thumb of the complimentary hand under the middle thumb joint of the firing hand. The series of photos following should clarify this description. Squeeze the pistol grip front to back with your firing hand while your complementary hand squeezes left to right. 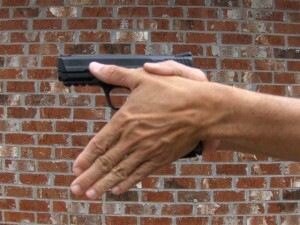 Some instructors teach that most of the pressure applied to the grip is with the complementary hand while the firing hand is somewhat less tight to give better trigger control. I find myself applying equal pressure with both hands. The pressure I apply is sufficient to control the pistol under recoil and then bring it quickly back on target. Please note that if you apply too much pressure, for example, a white knuckle death grip, your trigger manipulation may suffer. The above description is not engraved in stone, it is only what we find works best for us at this time. Give it a try and let me know what you think. If you have any questions or suggestions contact me. Our instructional methods have grown and been perfected with input and interaction with several hundred students over the last 14 years. If you would like personal instruction, contact us. If we can’t make you a better shooter, you pay nothing.